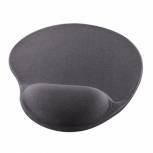 Kensington Foam Mouse Pad With Integral Wrist Rest Black 62384 Pack of 1 Kensington Mouse Rest Pad. Super cushioned wrist pad covered with soft fabric, distributing wrist pressure more evenly ensuring excellent support. Other features include a non slip base to keep the mouse pad in place. Colour - Black. Q-Connect Black Economy Mouse Mat Pack of 1 Q-Connect Economy Mouse Mat. Padded mouse mat with smooth cloth surface providing a consistent and clean mousing surface and superb traction. The mat is prevented from slipping by its non-slip base. Colour: Black. 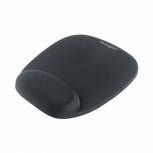 Fellowes Crystal Mouse Pad and Wrist Rest Black 9112101 Pack of 1 Fellowes Crystal Mouse pad and Wrist Rest. Ergonomically designed, transparent crystal gel mouse pad and wrist rest that supports pressure points thus alleviating and reducing strain to the wrist and surrounding area. Size: 235x200x25mm. Colour - Black. 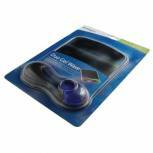 Fellowes Crystal Gel Mouse Pad Blue 9114106 Pack of 1 Fellowes Crystal Mouse pad and Wrist Rest. Ergonomically designed, transparent crystal gel mouse pad and wrist rest that supports pressure points thus alleviating and reducing strain to the wrist and surrounding area. Size: 235x200x25mm. Colour - Blue. Fellowes Crystal Gel Mouse Pad Purple 9144103 Pack of 1 Fellowes Crystal Mouse pad and Wrist Rest. Ergonomically designed, transparent crystal gel mouse pad and wrist rest that supports pressure points thus alleviating and reducing strain to the wrist and surrounding area. Size: 235x200x25mm. Colour - Purple. Q-Connect Blue Economy Mouse Mat 29700 Pack of 1 Q-Connect Economy Mouse Mat. Padded mouse mat with smooth cloth surface providing a consistent and clean mousing surface and superb traction. The mat is prevented from slipping by its non-slip base. Colour - Blue. 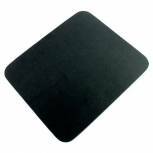 Q-Connect Black Gel Mouse Mat KF02213 Pack of 1 Q-Connect Gel Mouse Pad. 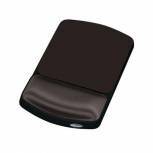 Cushioned mouse pad with a non skid-base and integrated gel filled wrist rest. Colour - Black. Fellowes Crystal Gel Wrist Rest Purple 91437 Pack of 1 Fellowes Crystal Keyboard Wrist Rest. Ergonomically designed, transparent crystal gel rest designed to cushion and support pressure points alleviating stresses and strains when using a keyboard. Size: 59x487x24mm. Colour - Purple. 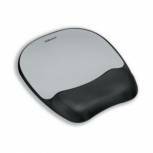 Fellowes Memory Mouse Pad and Wrist Rest Streak 9175801 Pack of 1 Fellowes Memory Foam Mouse/Wrist Rest. Optical quality mouse mat with soft foam pillow ensuring proper hand position while mousing. Other features include non skid backing holding the pad firmly in position. Design - Streak. 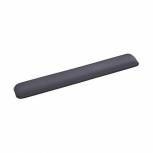 Fellowes Crystal Keyboard Wrist Rest Black 9112201 Pack of 1 Fellowes Crystal Keyboard Wrist Rest. Ergonomically designed, transparent crystal gel rest designed to cushion and support pressure points alleviating stresses and strains when using a keyboard. Size: 59x487x24mm. Colour - Black. 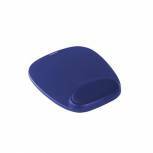 Fellowes Crystal Gel Wrist Rest Blue 9113701 Pack of 1 Fellowes Crystal Keyboard Wrist Rest. Ergonomically designed, transparent crystal gel rest designed to cushion and support pressure points alleviating stresses and strains when using a keyboard. Size: 59x487x24mm. Colour - Blue. Fellowes Premium Gel Keyboard and Wrist Support Graphite 91737 Pack of 1 Fellowes Premium Gel Keyboard and Wrist Support Graphite 91737. Provides exceptional support while redistributing pressure points. Soft, durable Lycra covering withstands daily wear and tear. Non-skid base holds wrist rest firmly in place. 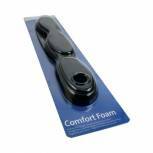 Fellowes Photo Gel Keyboard Wrist Support Beach 9202701 Pack of 1 Fellowes Gel Wrist Rest. 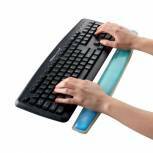 Keyboard wrist support made from stain resistant transparent gel with photographic image. Self adjusting gel conforms to users wrist for personal comfort. Helps to reduce overall wrist pressure and fatigue. Beach design. 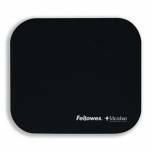 Fellowes Premium Gel Adjustable Mouse Pad/Wrist Support 9374001 Pack of 1 Fellowes Premium Gel Adjustable Mouse Pad with Wrist support. Optical-friendly mouse pad features superior tracking surface. Longer lasting polyester covering withstands every day wear and tear. 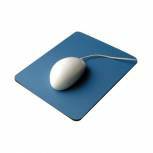 Kensington Blue Foam Mousepad With Wrist Rest 64271 Pack of 1 Kensington Mouse Rest Pad. Super cushioned wrist pad covered with soft fabric, distributing wrist pressure more evenly ensuring excellent support. Other features include a non slip base to keep the mouse pad in place. Colour - Blue.